Thinking about another idea while working in my favorite program for programming Sublime Text I realized I really like the feature where you can press CTRL+P, write first few letters of a name of an opened file and press enter to open it. And because we should quite soon have a new API in Blink Opera which allows developers to map a keyboard shortcut to open extension popup I decided to make an extension that would do something similar like Sublime Text does except I will be doing it with tabs and theirs titles/urls. Something happened and in the latest developer build I can access the extension through the keyboard shortcut only when on the Speed Dial page. Any ideas? Hi and thanks for the report! I can reproduce the problem in Opera 25 and I can reproduce the same problem in at least one other extension so the keyboard shortcuts seems to be broken. I will report this to Opera devs. Edit: Turns out the bug is already reported as DNA-24471 and confirmed by Opera Devs. I have still some plans, but I guess I can update what I've got now ready We'll do it later today! I really like TheSwitcher.2014-06-13.1.nex. Are you going to update Add-Ons with it or are you still tweaking things? Hi, I love your extension but I have some suggestions for improvement. I would like to see the ability to use it while having the extension icon hidden. If you are using the hotkey, I find that having the icon visible takes unnecessary space without really providing anything in terms of functionality. Also I would like to see some improvement to its performance, as it starts getting noticeably slow when you have many tabs open. A further idea of my own would be if you had a second shortcut which also brought up the list but on key release activated (switched to) that tab. If you don't release and press a second time it moves one down in the list. Suppose for example your second keyboard shortcut was Ctrl+k, if I pressed Ctrl+k and released both keys it switched to the last focussed tab. If I pressed Ctrl+k(release k)+k and then released both keys it would move back two in my most recently used history. Additionally Ctrl+Shift+k could go through the list in reverse. P.S. You may wish to exclude the closed tabs in the cycling. I will take all the ideas into consideration but it might take some time before I'll actually get to it and I don't want to make any promises. Quick Tabs also keeps track of tabs from multiple Windows and thus allows you to switch to a tab in another Window. I say, use whichever extension works for you best right now. I definitely won't get offended if you use extension that better suits your needs Also I don't think keeping Opera in mind will make much difference as I don't see many differences related to this extension right now that could cause trouble. For comparison, I have been looking at similar extensions in the Chrome extensions catalog. One I found is called Quick Tabs (direct install link). Whilst very similar to your extension it has a few extra ideas which I think are helpful. 1. The default list of tabs is in MRU (most recently used) order, meaning the last tabs you looked at are near the top. For me at least these are usually the ones I am most interested in. It also makes it somewhat similar to the old Presto Opera tab cycler. 3. The first entry is preselected. When combined with 1. and 2. this means pressing CTRL+M and Enter quickly switches to last selected tab (the most common tab I am trying to get back to). Another feature is keeping track of limited number of closed tabs and displaying them faded out at the bottom of the list (as metude requested above). This means the user can search these as well and reopen them by clicking them or pressing enter if they are selected. It is also possible to close tabs from inside the extension itself (something you hinted at adding). A nice final touch is that the extension's icon lists the number of currently open tabs, which helps give you a visual warning on if you are starting to have too many open (It also reminds me of Remco's old tab counter extension for Opera Presto). Now, I'm unsure what the best way to proceed is. I would prefer use an extension maintained by you since you are a long term Opera fan and contributor and hence I know that during development you will keep Opera in mind. That said, his version better suits my current needs. So my question is, would you consider some/any of his ideas in your version? He has an open license so you could even look at his code and perhaps use some of it directly (assuming that is feasible). Or in reverse you could work with him (assuming he is open to this) and add anything that you feel that you do better. P.S. His version is not without issues. Some of the keyboard shortcuts he defines within the extension do not work on Mac. I would have guessed it would be possible as I am also using Recent Tabs and hide its button and it is still able to show its tab cycler UI. Then again I have not really looked into this topic in any detail. Perhaps have Esc close the switcher window? I'm uploading it to addons catalog now. The escape key will close the windows unless you did search with zero results. In that case, pressing esc will clear the input box first. One of my favourite features in older (Presto) Opera was the ability to use the panel to locate and switch to tabs based on title search. Thanks for restoring this functionality! P.S. "Martin Kadlec is cool"
Yeah, I was thinking about adding some more features like closing tabs with delete key and searching in content of the tabs (though the second idea would be a bit complicated for performance reasons). It might help with performance to limit to searching the first few hundred (or thousand) characters of the page. This is what Stash searching does. Both Omni bar API and Commands API works fine in Opera Devs should update Opera Extension documentations. Last time I checked, it works in O17 when the extension is installed from *.nex file, but not when it is installed from unpacked directory. Commands API works for sure :cheers when it is installed from unpacked directory), can't say anything on Omni Bar API. I'd like to make this configurable in options page. I think when you start typing into addressbar bar you get already all the history/speeddial results. I'd like to keep my extension related only to tabs. One of the reasons is also performance, because the Damerau–Levenshtein is quite expensive operation. Is it possible to open popup in the middle of top ,below adress bar, instead under button? -I think it would be better if it remembers last 10/15 pages instead 5 Even , it is pretty good if it sources tabs from history of course if possible. - Is it possible to open popup in the middle of top ,below adress bar, instead under button? 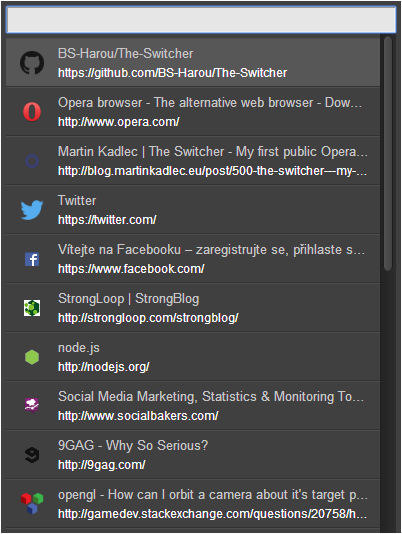 How about adding latest 5 closed tabs in the list and if it's selected opening it in new tab? maybe worth waiting for the omnibar API? Rozsirenie mi pripomina Blitz Full Screen URL Launcher z Google Chrome, ale tam namiesto hladania sa zobrazovala editovatelna URL adresa. Interesting idea.If keyboard shortcut works , can be nice. It is just for search on tabs? Right? Today I found an extension to manage extensions in Chrome store It is also nice and works with Opera. It is just for search on tabs? Right?